Operated by the company Donateu Limited, ScratchMania is an online scratch card room that has a license issued by the Gaming Commission of Cyprus, a country that has been a member of the European Union since 2004. Powered by software from Netoplay, ScratchMania offers games, promotions and services that largely measure up to those of its rivals, the only difference being that the operator is known for its sensational jackpots available throughout the year. 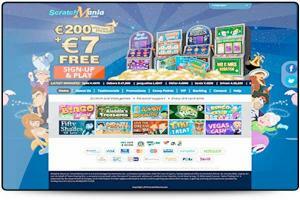 ScratchMania guarantees a winning card for every three drawn, which is why this site has very quickly captured the hearts of European players, particularly those residing in France. Currently offering around forty original games, ScratchMania is not content simply to offer Internet users scratch card games, and so it includes other forms of entertainment in its game library. Indeed, on ScratchMania, users can also bet on slots and on certain table games. Each game corresponds to a theme and a genre specified on the website of this operator, which guarantees players many hours of fun. ScratchMania is powered by the software platform of NetoPlay. It is this publisher recognized for its reliability and professionalism that lies behind the quality of the ScratchMania website and its games. Its intuitive and ergonomic platform is easy to use and is fully secure thanks to a 128-bit protection system. ScratchMania also has a random number generator which has been tested in advance. While ScratchMania offers a not-insignificant free bonus of €7 like the vast majority of its competitors, players should instead look to the deposit bonuses. Indeed, the operator offers a 100% bonus on the user's first deposit into his real money account. This bonus will even enable him to participate in a random drawing, with the possibility of winning an exceptional jackpot of €200,000 to boot! Otherwise, ScratchMania offers a 15% bonus with the use of electronic wallets Skrill and PaySafeCard, as well as comp points redeemable for gifts and cash. Finally, ScratchMania offers weekly bonuses as part of its VIP loyalty program. ScratchMania enables its members to effectuate their deposits and withdrawals in euros, U.S. dollars and British pounds. The operator offers its players no fewer than fourteen methods of international and regional payment methods to be used at their convenience. While the use of traditional credit cards VISA and MasterCard is offered as a matter of course, players can opt for more exotic transfer solutions such as iDeal, Skrill, Carta Si and Dankort.